I should have been a journalist. Because after watching this weekend’s football (and the U.S. premiere of season three of Downton Abbey), there is one interview I’d very much like to conduct. “Who might that be? And why are you talking about football, a subject about which you know so little and so far afield from the purported purpose of your blog?” you might be thinking. And these are all good questions. While I confess to knowing only a little about the game of football, I’ve kind of learned to enjoy watching it. It’s given me something to talk about at work, where few and far between are the people who have any interest whatsoever in books and reading. The number one person I would like to interview in the world of football? Aaron Rodgers, quarterback for the Green Bay Packers. He comes across as being very humble, which I really appreciate in any person, and we’re roughly the same age. And then he sometimes wears what looks like a turtleneck under his jersey when he’s playing in the cold, and I think it’s kind of adorable. Are you familiar with the public television phenomenon Downton Abbey? 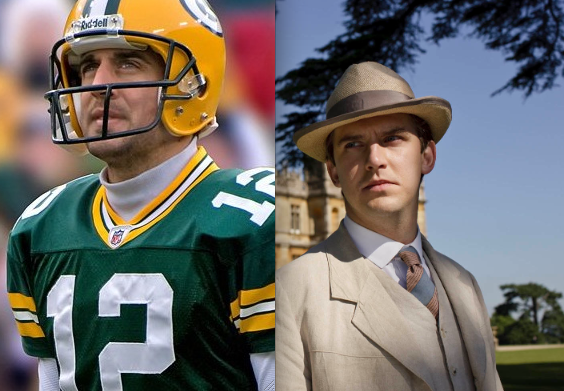 Has anyone ever told you that there is a striking resemblance between yourself and Dan Stevens, who plays Matthew Crawley on Downton Abbey? Because it’s almost like he could play you in the movie version of your life. Is that really a turtleneck you wear under your jersey when it’s cold outside? Maybe more of a mock-turtleneck? And then, because I’m not actually a journalist, and because I probably couldn’t speak to anyone famous without blushing, and because I would never presume to talk about football like I actually know about football with a professional like Aaron Rodgers, I would want to hand the interview over to a real sports journalist, like Bob Costas, before I could really embarrass myself. If I hadn’t already. This entry was posted in Miscellany, Stories and tagged Aaron Rodgers, Dan Stevens, Downton Abbey, football, random thoughts on January 7, 2013 by ms.grammarian. It would definitely be more interesting than the breathless “How do you think you played today/What did this game mean to you” interview questions immediately post game we currently endure. If that helps.